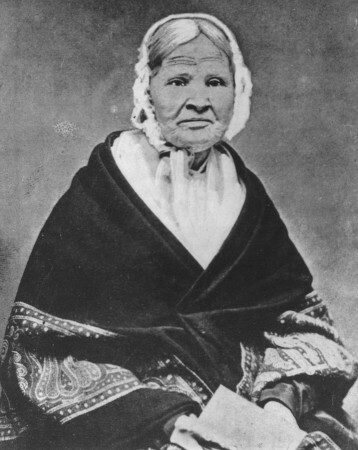 Louisa Ann (Eliza) Swain of Laramie was the first woman in the United States to vote in a general election after the Wyoming Territorial Legislative Assembly gave women the right to vote in December 1869. On September 6, 1870, Mrs. Swain happened to walk by the polling place, which had not yet officially opened, but election officials asked her to come in and cast her ballot. The Laramie Daily Sentinel described her as “a gentle white-haired housewife, Quakerish in appearance.” Swain was 69 years old and one of 93 women to vote that day in Laramie. In 2005, a bronze sculpture honoring Swain was dedicated in front of the Wyoming House for Historic Women. The museum is located on 2nd Street between Garfield and Grand in Laramie and honors twelve Wyoming women whose lives have impacted the world.